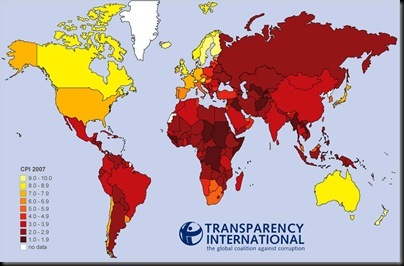 Transparency International’s Annual Corruption Perceptions Index measures perceptions of corruption by business-people, risk analysts and the general public, and ranges between 10 (highly clean) and 0 (highly corrupt). Yuo can read more about this on their website here. Interesting to see we live in one of the cleanest countries in the world, what a wonderful country. Click for full size. Go Aussie – we’re beating America – yea! Looks like Norway and Sweeden aren’t bad spots to do business. I guess there’s not much surprise in the results from places like Russia, Sudan or Myannma.